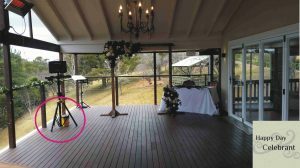 At a recent wedding at Chapel Hill Retreat the ceremony was moved to the verandah off the main reception area due to rain. Even though this was effectively an indoors wedding, I still chose to use the portable mains system you can see circled in red. No ugly power cords to spoil a photograph. The system works flawlessly. The wedding was conducted in full Scottish dress – photos to follow once permission gained from the bride and groom.